Made by Rahman, Surayia in Dhaka, Bangladesh, 1983-1984. Quilt, 'Nakshi kantha' (embroidered quilt), cotton / silk, designed by Surayia Rahman, Dhaka, Bangladesh, 1983 - 1984. A large, square, hand embroidered quilt on a cream background. The outside edge has been bound with red stitching in a zig-zag pattern. 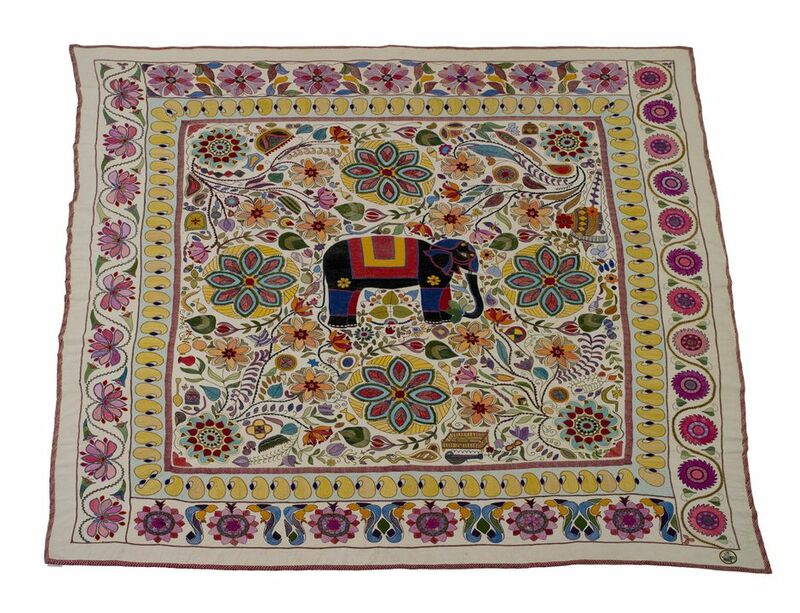 The dominant central motif is a black elephant embroidered with trappings and flowers, surrounded by four padma (lotus), amidst a profusion of gaily coloured plants, birds and symbols of everyday life. The central panel is surrounded by dark red herringbone stitching. The outer border consists of red and pink flowers and green leaves which are varying interpretations of the lotus flower, being different on each of the four sides. On each of the long sides the lotus are interspersed with a sweeping 's' line. Inside that border again, on a pale blue background, there is a row of yellow boteh (in Bangladesh, kalka) motifs. Embroidered on reverse 'SKILL DEVELOPMENT FOR/UNDERPRIVILEGED WOMEN/DEC. 1/83 - DEC 1/84/EIGHT WOMEN WORKING PER DAY/DESIGNED BY - SURAYIA RAHMAN/SUE AND ALLAN - WEDDING ANNIVERSARY/28.1.85'. The quilt was designed by a well-known local artist, Surayia Rahman in Dhaka, Bangladesh. Although this nakshi kantha was made in the early 1980s, the figurative designs used are all traditional kantha motifs - every-day items with which the embroiderer would be familiar. These include birds, flowers (eg the lotus and the sunflower), trees and animals. Also to be found on this kantha are a bed, a snake, a comb, a baby's cradle, fish, butterflies, a loti or water pot, a fan, parrots, and caterpillars - all of which are traditional motifs. The earliest kantha were embroidered with just red, blue and black thread; yellow, green and pink colours were added later. Originally, the main stitch was simply the running stitch which created a ripple effect in and around the patterns; darning stitch was used to fill in the motifs. Nowadays the women embroiderers, while still utilising the simple running stitch, also use chain, herringbone, satin and cross stitch. This quilt has been made using modern, new, materials but adheres faithfully to the old style and process of production. The old traditions were followed by first drawing the design free hand on the material to be embroidered; the needlework was then carried out in silk thread utilising numerous different closely set stitches with the traditional quilting running stitch giving life and movement. This particular quilt was hand-embroidered in Bangladesh by eight women working every day for one year under a scheme to enable impoverished women to learn a craft and earn the means to keep their family. All the labour, dyes, designs etc necessary for the industry are produced locally. This quilt was made 1983-1984. Traditionally, kanthas were made in many different sizes and used as winter quilts, covers and wraps for books and valuables, as sitting mats for ceremonies and most often as gifts - the shape and size of each piece determining what it would be used for. A pregnant women will sew a kantha for her baby and the bride-to-be will take a new kantha to her husband's household. Nowadays they are being reproduced for the foreign market for use as bed quilts. This particular piece is thick enough to be used as a floor rug. Purchased in Bangladesh on 28 January 1985 by the donor Sue Tuckwell and her husband Allan Tuckwell, who were at that time living in Dakha.